Agriculture is in Dr. Jeanna Mastrodicasa’s blood. Each year, her grandfather would plant a robust garden for the family to enjoy in the Massachusetts town she grew up in. On the other side of her family, her great grandmother packed grapefruit in Indian River County. Dr. Mastrodicasa grew up having an interest in food and a love for cooking, so it was only natural that she would attend three land grant universities (Georgia, Tennessee, and Florida) and submerse herself in agriculture programs. Today, as Associate Vice President for Agriculture and Natural Resources at the University of Florida Institute of Food and Agricultural Sciences (UF/IFAS), Dr. Mastrodicasa is still focused on her passion and using her position to strengthen the industry in the Sunshine State. In charge of operations budget, facilities, information technology, business operations, and more, Dr. Mastrodicasa assists with government relations in both Tallahassee and Washington D.C. “Essentially, I do what I can to provide operations to support the programmatic decisions of the leadership of IFAS,” she explains. “We have 3.7 million gross square feet of built space we own and maintain across Florida, so there is always something to do.” As part of her job, Dr. Mastrodicasa listens to the current issues of Florida stakeholders, and assists in incorporating and addressing those needs within IFAS. The Florida Agricultural Statistics Service (FASS) ranks the Sunshine State first in the U.S. for production value of several commodities, including oranges, fresh market tomatoes, grapefruit, and sugarcane. And the state ranks seventh in the U.S. for agricultural exports. Dr. Mastrodicasa is one of many women playing an important role in Florida agriculture. According to the U.S. Department of Agriculture, 36 percent of Florida farmers are women. That’s over 26,000 female farmers in the state, tending more than 2.5 million acres of land. That’s a $433.3 million impact in an industry that is worth billions. But they are not only impacting the industry and advancing their own careers; they are educating, encouraging, and empowering the next generation of farmers who are tackling the world’s growing fuel, food, and fiber needs. 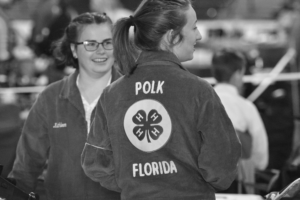 Women are helping maintain and grow Florida agriculture, and furthermore, a select few leaders are also doing their part to support and advance the industry. Dr. Mastrodicasa is one of 3000 faculty and staff at 16 research and education centers across Florida who are doing their best to make improvements for agriculture and natural resources, as well as connect those efforts to Florida’s citizens. “I am proud of the work we do and I take opportunities to bring my twin seven-year-old daughters, Scarlett and Savannah, to public events connected to agriculture to teach them as much as I can,” she shares. The UF/IFAS is a huge asset and resource to the industry. It works with growers in addressing ongoing issues like citrus greening as well as researching new crop opportunities like olives or hops. “In Florida, there is a lot of exciting work happening with our IFAS team to make a difference for agriculture and natural resources,” adds Dr. Mastrodicasa. The majority of students in the program are women, who go on to graduate from the college and hold positions in all aspects of Florida agriculture. That may be a surprise to some, but those leading the way and preparing the next generation of leaders and innovators for the industry are women too. In fact, women make up half of the leadership of IFAS— including the UF/IFAS dean for Research and the UF/IFAS dean of the College of Agricultural and Life Sciences. R. Elaine Turner, PhD., the dean of the College of Agricultural and Life Sciences, has been at the University of Florida, in IFAS, for 21 years. She started as an assistant professor in Food Science and Human Nutrition and worked her way up to associate dean, and then most recently, she has been serving as dean the last three years. Like others, agriculture is in Dr. Turner’s blood. Her father grew up on a farm in Kansas and became a professor of Agricultural Engineering at Ohio State University where he was involved in research at the Ohio Agricultural Research and Development Center in Wooster, Ohio— the Midwest town where Dean Turner was raised. She always had an affinity towards science, math, and food, which led her to study nutrition and dietetics as an undergraduate student and ultimately to a university position teaching nutrition to undergraduate students. As dean of the College of Agricultural and Life Sciences, Dr. Turner is responsible for the academic programs IFAS offers to undergraduate and graduate students. Her position provides oversight of curriculum, teaching, and student services for nearly 6,000 students studying in more than 20 different disciplines in agriculture, natural resources, and life sciences. Agriculture is a multi-billion-dollar industry in Florida, producing hundreds of products for the marketplace and employing more than two million people. Women like Drs. Mastrodicasa and Turner have played a vital role in sustaining that industry and preparing the next generation of leaders. “There are great career opportunities in agriculture,” says Dr. Turner. “The challenges we face in Florida agriculture and around the world require creative minds and broad interests in science, technology, business, community services, and human sciences.” Meeting those challenges will take a strong investment in agriscience education to prepare young minds in school today to become the next generation of leaders— male or female— in Florida agriculture.